Ballygowan has just launched a brand new campaign, "Drink It In", celebrating the brand's new look and design and driving uptake within the 20 to 30 year old market. The campaign not only features a TV ad, but also utilises radio, PR and social media. 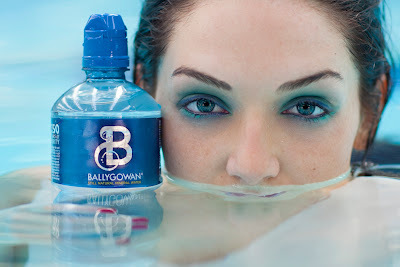 Speaking today at the official launch of the new campaign, Head of Marketing for Ballygowan, Leonie Doyle said “Water boasts so many benefits to both body and mind that help you to feel your best inside and out, and we wanted to celebrate this power and brilliance with a whole new look for Ballygowan, encouraging the nation to drink it in." Meeting House Square in Dublin’s Temple Bar was selected as the location for the ad for its fresh new look, offering an undeniably Irish contemporary backdrop. The advert dives into the everyday lives of modern Irish people who have been delighted and captivated by the power and brilliance of water using an innovative water display mechanism called “Aquagraphics”. The technology creates aqua visuals which tell the story of Ballygowan’s journey from rainclouds to the bottle. The chosen track to accompany the ad titled “Outdoors” by up-and-coming County Down band Kowalski, was selected for its “sense of vibrancy and flow that works in perfect harmony with the movement and energy of the water”. The Ballygowan campaign was developed by Irish advertising agency Cawley Nea TBWA and post produced by Piranha Bar, a Dublin based Creative Content Studio and Production Facility. “Drink It In” will air on television screens for the first time tomorrow, Thursday, 12th April 2012. For more details and behind the scenes footage log onto Facebook.com/BallygowanIrishWater. It was filmed over a 15 hour shoot day. It required two days transcoding, 4 days editing and several days compositing and grading, together with several days animation time also. It is a sophisticated blend of high end digital film with green screen compositing, computer generated assets, relighting tools and skilled retouching. The final look of the film is created with Lustre - a film grading tool regularly used on blockbuster films like Lord of the Rings and King Kong! The ad would not have worked using CGI along - which augmented the real thing, so when people get wet in the ad – they really do get wet! The Aquagraphics installation consists of two layers made up of 380 separate nozzles per metre (the main screen was 9 metres long!) which are linked to a computer which then triggers the action of the nozzles by scanning the lines of a computer image. The nozzles trigger on and off in a fraction of a second, creating 'water pixels' which cascade downwards in the pattern of the original image. The Aquagraphic screen recycles all of the water it uses from a small reservoir making it completely sustainable.